SBI PO prelims 2018 analysis: The SBI Probationary Officer (PO) preliminary examination was conducted today on July 1, 2018 for a total of 2000 vacancies. SBI PO prelims 2018 analysis: The exam is being conducted in 4 shifts today on July 1 and then on July 7 and 10. SBI PO prelims 2018: The State Bank of India (SBI) conducted the Probationary Officer (PO) preliminary examination today on July 1, 2018. The exam will next be conducted on July 7 and 8. A total of 2000 vacancies are available. The registration for the same began on April 21 and the last date for submission of applications was May 13. Today was the first day of the preliminary exam and the first slot is over. The exam is being conducted in four-time slots: 2 each in morning and evening. A total of 100 questions had to be answered in 60 minutes. All the sections, except the English Language, were available in both English and Hindi. Every correct answer will fetch 1 mark, while every incorrect answer will reduce the score by 0.25. Scoring anywhere between 53 to 58 will be considered good. A total of 5 questions were asked from number series. DI part was calculative and time taking. The overall difficulty level of this section was moderate. The reading comprehension was economic growth based and and had 6 questions. One vocabulary based question was asked. The difficulty level was moderate to difficult. 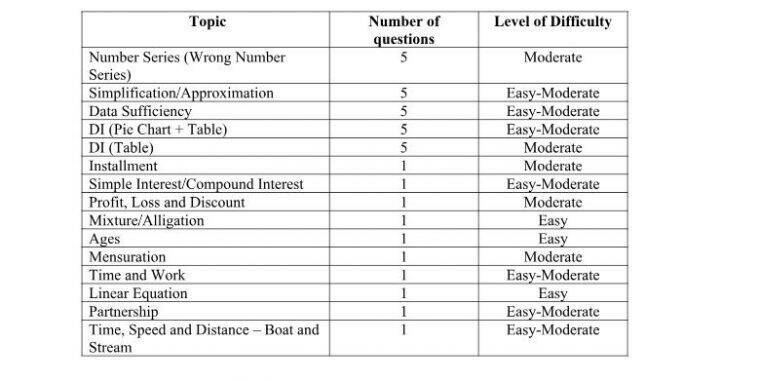 There were 5 para jumble questions which were of easy to moderate level. 4 questions were from fill in the blank and 15 spot the error questions were framed. Reading Comprehension (RC) was lengthy and difficult. The overall difficulty level of this section was moderate. Analytical reasoning sets were moderate-lengthy, not easy. The overall difficulty level of this section was moderate. Reading Comprehension (Paradox of plenty based) had 7 questions and 2 vocab based questions were asked, which were of easy to moderate level. 5 para jumble and fill in the blank questions were framed and there were 6 phrase/word replacement questions. 5 spot the error questions were there and 2 statement connection questions were also asked. Reading Comprehension (RC) was easy-moderate. Two questions were from vocabulary (1 synonym and 1 antonym). The overall difficulty level of this section was moderate to difficult. DI part was calculative and time taking. The arithmetic-based questions were primarily from time and work, partnership, profit, loss and discount, time, speed and distance, SI/CI, mixture, etc. The overall difficulty level of this section was moderate. Some analytical reasoning sets were moderate-lengthy, not easy. The overall difficulty level of this section was moderate. The reading comprehension was based on women empowerment and 5 questions of moderate level were asked. There were 2 vocab based questions and 5 para jumbles. 5 fill in the blank questions were framed and phrase/word replacement had 5 questions. 5 questions were asked from cloze test and statement connection. Reading Comprehension (RC) was moderate. Two questions were from vocabulary (1 synonym and 1 antonym). The overall difficulty level of this section was moderate. DI part was calculative and time taking. The questions on number series were moderate. The overall difficulty level of this section was moderate.